Guide: Using The Portal | A. Leake Accounting, Inc.
Once you have been added to the portal system, you will receive an email notification with your secure portal login information. This is your username and password. The username is your email address and the password is automatically generated. You will be able to change this later on. Click this link to access the login page. 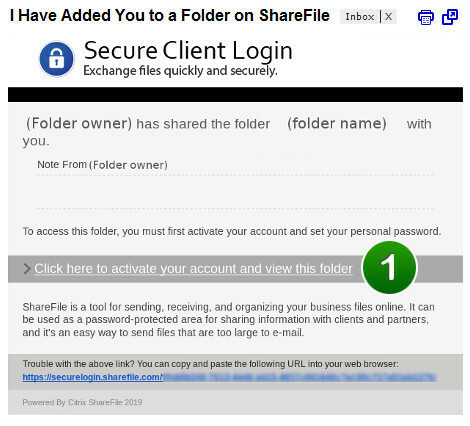 Now that you have your login credentials, you can access your private folder. Enter the email address from which you received the activation email notification. Alternatively, you can login directly from our website. Since this is your first login, you will need to confirm your personal information. You must also select a new password. We will not see this password. Should you forget it in the future, you can have a new randomly generated password sent to the email address on file. Confirm your personal information and enter your new password. This is the page you will always see after logging into the portal. This is the list of files and folders in your private folder. This is the list of people who have access to your folder. Downloading a file means to take a file from your folder and put it on your personal computer. To download a file, press the arrow next to the file you wish to download and then select Download. Uploading a file means to take a file from your personal computer and put it on your computer. To upload a file, press the Upload button. On this page, we will gather a list of files to be taken from your computer and added to your folder. This section explains how the upload process works. Select "Choose Files" to continue. From this page you can browse your computer's files and navigate to the file(s) you wish to upload. Select the file(s) you wish to upload. Press the "Open" button to continue. On this page you can alter the title of the file as well as specify details about the file and select whether or not you would like to notify someone that a file has been added to your folder. Change the file name or leave it as the default value. Select this checkbox if you wish to notify someone that you have added this file to your folder. Press the "Upload Files" button to continue. If you opted to send an email notification in the previous step, you will now be able to select who you wish to notify. Check the box for each person you wish to notify. Press the "Send Notifications" button to continue. Depending on the size of the file(s) you are uploading, it may take a while to complete. Once finished, you will be redirected to your main folder page. As you can see, the sample file we uploaded in the previous steps is now visible in your folder. If you opted to send an email notification in the previous step, the recipients will now be notified about the file you added.